Exaclair Inc. is the exclusive US distributor for the French company Exacompta Clairefontaine which makes Quo Vadis and Exacompta planners as well as Clairefontaine and Rhodia notebooks, J.Herbin fountain pen inks, and a bunch of other high-quality products. 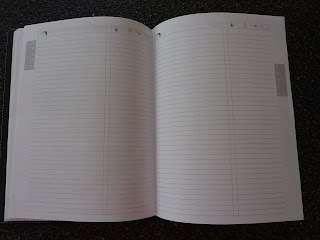 The paper they use in their planners and notebooks is famous for being extremely smooth, and the heavier weights are loved by fountain-pen users. 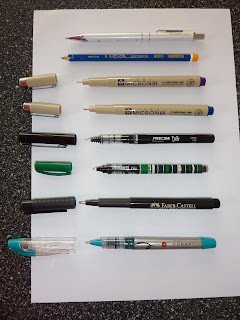 I really like Exaclair products and I have reviewed several of them here on Plannerisms. This week I have some new reviews for you, and will also talk about some of their new products coming out soon! 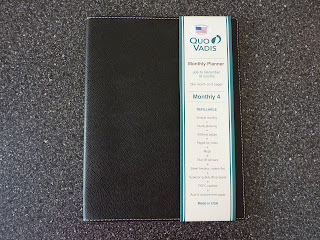 To kick off the week I want to tell you all about my fantastic Quo Vadis Monthly 4 planner that was very generously sent to me by Karen at Exaclair. Thank you Karen! The Monthly 4 is an 18 month planner (July 2009 through December 2010), which is useful for anyone on an academic schedule or calendar year. The generous page size ( 7 x 9 3/8 inches) gives plenty of room for writing on each monthly spread. The book is very slim with a flexible cover so it can slip easily into a portfolio, briefcase or bag. The cover is refillable and comes in a variety of colors including blue, red, pink, lilac, brown and more. I really appreciate that these planners are made in the USA and that the paper is made from sustainable sources using a very environmentally-friendly process. In this monthly format each week begins on Monday, so that the weekend days are together instead of split on 2 lines. I prefer this format instead of having the weeks begin on Sundays. My weekly planner starts each week on Monday, so I like having my monthly calendar using the same week setup as my weekly planner. And, having my weekend days together allows me to see and schedule my weekend plans easily. The Monthly 4 is different from every other monthly planner I've ever used: on every month's page there is a dashboard of list boxes at the side of the page, and plenty of room for notes in the large Notes area at the bottom of the page. (You can click on the photos for a larger view) The list boxes are labeled Priority, Phone, Fax-Email, See-Do, Pay-Receive and Notes. (And of course you can re-label these to use them for different purposes if you like). I love having space for notes and reminders on the monthly pages! One is to remove the small Notes box under Pay-Receive, to make the Pay-Receive box larger. I usually have plenty of things to Pay (unfortunately not as many to Receive!) each month so I'd appreciate more space in that box. I don't think anyone will miss the small Notes box because there is plenty of room for notes in the space at the bottom of the pages. The other is to do away with the black boxes that contain the dates in the daily boxes. I would prefer just having the numbers printed in black instead of inside the contrasting black boxes. 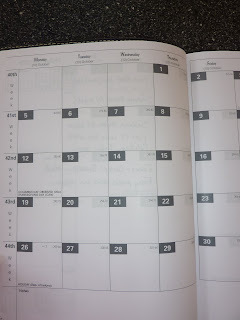 I think not having the black boxes for the dates would give a cleaner and more streamlined look to the monthly pages. 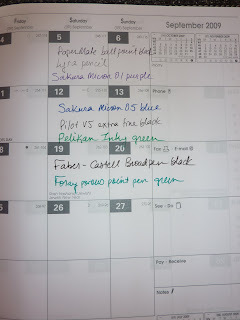 The only other suggestion I have is to use two colors of ink similar to how they are used in the Minister (dates and holidays are in teal, the current week on the monthly reference calendar is highlighted in teal, etc.) I think it looks pretty and is visually interesting to have the two colors on the page. But, I do realize this could increase costs which may or may not be acceptable, so it's only a suggestion. 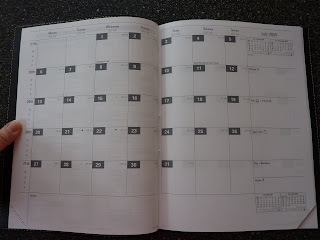 In addition to the monthly calendars, there is an anno-planner for 2010 with the entire year visible across the two-page spread. This is excellent for planning travel, projects, holidays etc. and to get a summary of your entire year at a glance. 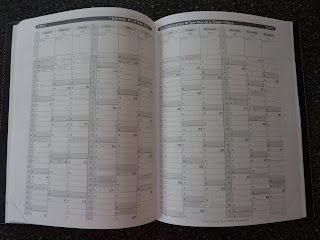 There is also an anno-planning calendar for 2011 for longer-range planning. Below you can see the back side of the test page. There is absolutely no bleed-through of any of the inks. I thought that the Broadpen would have bled through, because it does with most other paper I use it on, but it didn't at all here. There is some slight show-through of some of the inks, but even with the thickest lines the show-through is not significant enough to affect writing on the opposite page at all. This planner has detailed maps of every continent showing the countries and lots of cities (and we all know how much I love maps!). There are lists of international telephone dialing codes (both into and out of each country, which is crucial) and an excellent chart of international holidays. I actually use these resource pages, so I appreciate them very much. In the back of the planner there are 14 (!) pages for notes, and several pages for contact information. ~You know what would be a great use for this planner, is planning a round-the-world or other international trip. You could use the yearly overview calendar to plan your travels throughout the year. The monthly calendars would offer plenty of space for writing transportation details, reservation information, and phone numbers. You can track your trip on the maps, tracing your route from destination to destination. In the contacts section you can write in all the places you stay (because maybe you'll be back that way again someday and want to stay there again). In all those notes pages you can stick in ticket stubs, write the name of your favorite restaurants where you ate, note bus schedules, and whatever other details you want to reference later. And at the end it would make a great record of your big trip! **Edited much later to add: I keep thinking of great uses for this monthly planner. Because it's 18 months, you can use this planner for things that go beyond the calendar year. And because there's plenty of room on each monthly page for notes and lists, you can use it to work out what has to be done each month to prepare for a big event. ~This planner would be especially useful for planning a move or a wedding. You could mark the date of the event, then backtrack and note what has to be done each month to prepare. (Wedding example: what has to be done each month to arrange the catering, flowers, invitations, reserving venues, dress selection and fittings etc.). ~It would be great to use during pregnancy to prepare for the baby's arrival. The mom-to-be could mark her due date, then backtrack to note what she has to do each month to prepare (such as arrange for maternity leave, preparations for the baby's room, baby gear to buy etc). Also the monthly format makes it easy to schedule all those prenatal appointments and childbirth classes. ~Over on the Quo Vadis blog, Leah describes how she's using her Monthly 4 as a garden planner. ~I am using my Monthly 4 (extensively!) for planning and tracking my blog posts. I have multiple blogs that I write for, and the large layout of the monthly view helps me keep them all organized. There's plenty of room to write post titles into the daily spaces. Luckily the strong paper holds up to lots of erasing, because I change my mind and re-arrange posts all the time! I have notes, reminders and topics to cover that month written into the notes boxes. In the notes pages in the back of the book I have lists of reviews to do, ideas for posts, and future plans. There are endless uses for this planner! The Monthly 4 has a great monthly format with lots of space for notes, excellent reference pages, and a large page size in a slim, portable book. So if you are looking for a monthly planner that will keep you organized, I recommend you check this one out! Thank you so much for following my blog! I hope for many comments from you in the future! You're welcome Abby, it's great!